hipsale has no other items for sale. They are fine for key rings, not worth a flip for rappelling down a cliff face... too small. What can I say? 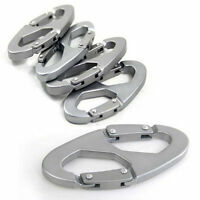 They are plain ordinary inexpensive carabiners for use in instances that do not require the highest quality. If looking for Mountaineering, look elsewhere.